A major planetary shift occurred last week when, on May 15, 2018, the planet Uranus left the sign of Aries where it had been since 2010. It moved into the sign of Taurus where it will remain until 2026. 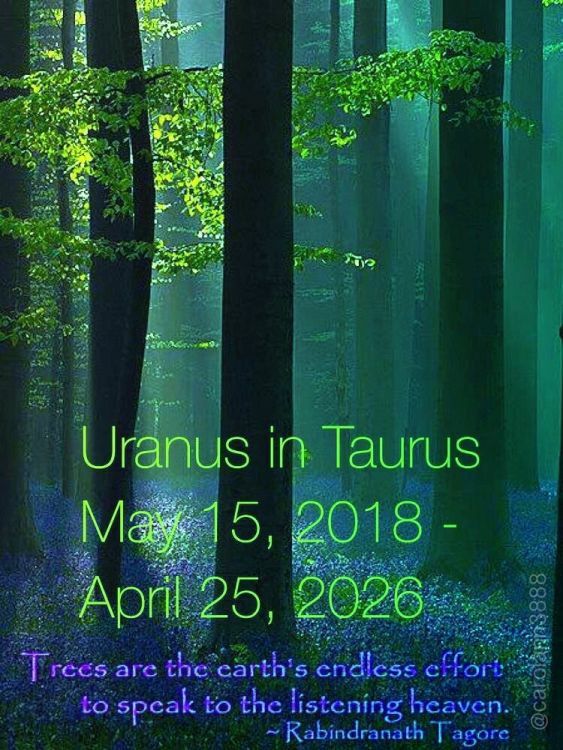 Uranus descended into Taurus just hours after the NEW MOON in Taurus. New Moons are new beginnings. This day is a landmark, a turning point, into a new era of anchoring higher consciousness into the realm of 3D and into our bodies. This is a new era for us, but even more so for the Earth. Uranus is re-incarnating on Earth. The last time it embodied here was 84 years ago, in 1934. Its future incarnation won’t be until the turn of the 22nd century. It is a rare and special visitor to this land. Like a comet that will hover for 7 years. An extra-terrestrial messenger with a very long story to tell, who takes on a ‘flesh suit’ and sits around the campfire with us. Quantum Physics (e=mc2) tells us that Matter – everything that exists in our 3D mater(ial) world - is simply Spirit moving slowly enough to be seen. Light is the flow of energy; and when Light gets stopped, it ends up as matter. Matter is frozen light. Uranus in Taurus is exactly like that. The lightning, energy and electricity of Uranus comes to a stop. It strikes the earth and is absorbed, halted. Taurus is sloooow. Uranus is FAST. The first shall be last, the slow shall be fast. The fast shall find peace among the trees. What happens now is the global grounding of electric Spiritual energy (Light) into magnetic Earth (Matter). Including our human bodies, carbon lifeforms. No Wi-Fi in the forest? There will be now. We will be wired for sound, with our clay feet on the earth. This is a ramp-up of our Light Quotient, but it must happen at a deep cellular level. At the Soul level, Uranus reveals to us our individual and unique gift, the thing that no one else can bring. Now we will give it to the Earth. The waves of energy will surge through the realm of 2D – the Elementals, the Telluric Realm, Devas and Dyads, Elohim in miniature in each leaf and blade of grass. Electric juice will charge them with long-missing light of a very high vibration, bringing a new vivification to these beings who are loving helpers to us on our soul journey. We will ingest this light and breath it in, in the sylphs of the air, the salamanders of the warm sun, the undines of the clear waters they give to us. It’s time for a revolution for Mother Earth and all of her creatures. The ‘zeitgeist’ of our world changes drastically with the shift of the planet Uranus. There are many layers to the changes, what we’ve talked about here is but scratching the surface. Our only job right now, as this new era begins, is to begin to discern how this energy feels for us. Each of us will feel it differently, but for certain our electrical circuits will be charged in new ways. A re-wiring will take place, unfolding over 7 years, and especially the next 1,277 days. No need to ‘understand’ this intellectually right now. Just ponder on the thoughts shared here and then listen to your body, read the electricity in the air, get grounded and stay open. Here's to a splendid new 7-year cycle, an adventure ahead of us. I'm excited to walk the road with you on our continuing journey together. More will be revealed!